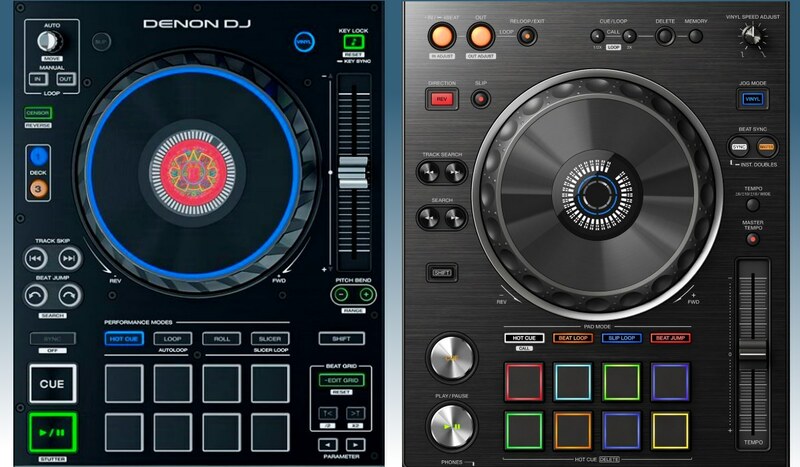 Home DJ Guides And Tutorials Pioneer DJ XDJ-RX2 Versus Denon DJ Prime 4: Which One Wins? The Denon DJ Prime 4 came out around Namm 2019 and ran away with all the attention. But the Prime 4 is not the first all-in-one DJ system to come out. Pioneer DJ has been perfecting their XDJ line for a long time and the XDJ-RX2 is the current top of the line model of that range. On first inspection, the Prime 4 is the obvious winner. It has 4 channels against the two channels of the XDJ-RX2, a larger touchscreen, more audio output options, and all that at almost the same price. But it’s my duty to dive into the details, and that’s exactly what we are going to do here. The Denon DJ Prime 4 is a real beast to look at. The large screen, the 4 channels, the jog wheels with the full-color LCD central screen and the very reasonable price are all very appealing. The Prime 4 runs on the Engine Prime software, which is Denon DJ’s music management software platform. Engine Prime supports Serato and Traktor Pro which makes it easy to migrate your existing Serato and Traktor libraries. The XDJ-RX2 is Pioneer DJ’s top of the line offering in the XDJ range. 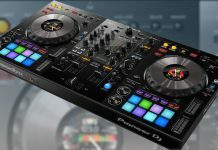 It has a lot of features that will interest professional DJ’s, such as a large touchscreen, 8 performance pads per channel, a DJM-like hardware mixer and excellent jog wheels. The unit runs on Rekordbox, which is the software choice of many professional DJ’s all around the world. When putting the decks side by side it’s interesting to see how similar they are. Both have 8 performance pads with comparable performance features. On top of each deck, there are loop controls on both decks. While Pioneer DJ uses their traditional yellow loop in and loop out buttons, the Prime 4 includes a rotary encoder to set automatic loops. I like that and find it more practical to use for loop setting, especially when playing with tightly beatgridded music. The jog wheels on the Prime 4 have a central LCD screen that not only shows track artwork but can also show, for example, the length of an active loop. The LCD screen on the Pioneer DJ is a bit more basic but still shows all the needed information, such as the needle position. Both decks have slip buttons, but the XDJ-RX2 has a vinyl speed adjust knob which is a nice to have when you like to control the stop speed of your track. TIE The Prime 4 and the XDJ-RX2 have similar features on the decks, and to me, both have a very strong offer. There are some things I prefer on one and some on the other, so let’s call it a tie to start of in good spirits. 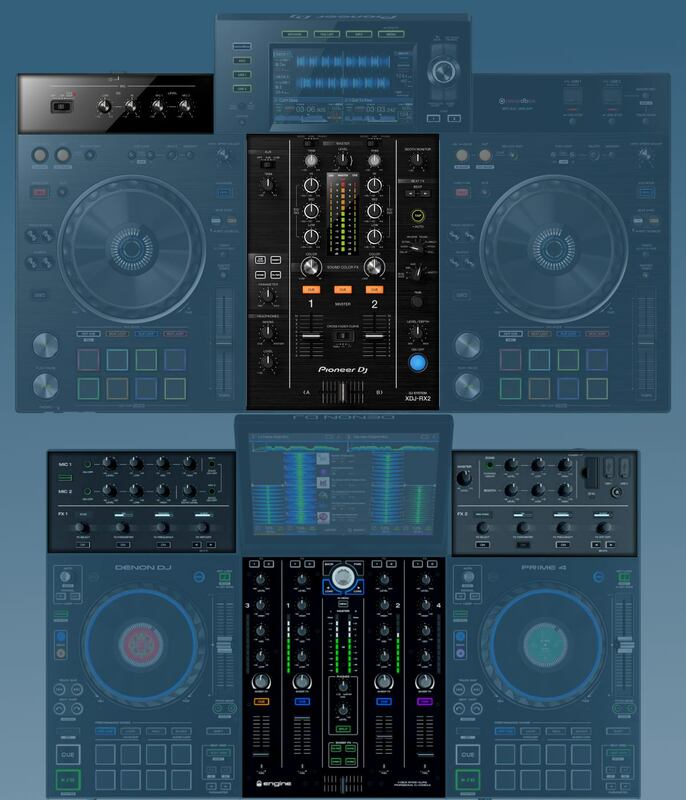 It’s hard for the XDJ-RX2 to compete with the Prime 4 on this point. The Prime 4 has, obviously, the better screen, being 10″ in size against the 7″ of the XDJ-RX2. On top of that, the Prime 4 screen feels and works much like a modern tablet or smartphone screen: it supports multi-touch gestures such as pinching and swiping. The XDJ-RX2 screen is much more basic, as Pioneer DJ hasn’t yet implemented modern touchscreen technology in their players. On top of that, the Prime 4 screen can be tilted into multiple angles, which makes finding the perfect viewing angle under any lighting situation easy. The only downside of the Denon DJ’s Prime 4 screen is the fact the waveforms are stacked vertically. On the XDJ-RX2, the waveforms are oriented horizontally. If you can’t handle vertical waveforms, then the XDJ-RX2 might be a better option. DENON DJ PRIME 4 The Prime 4 wins this part hands down. The screen is simply more advanced, easier and more practical in use and bigger than the one on the XDJ-RX2. Denon DJ has a reputation for catering to the professional mobile DJ. Therefore it’s not surprising the Prime 4 is filled with features that will please that sort of DJ, such as double mic inputs, zone output, 4 hardware channels that have individual RCA inputs each and more. 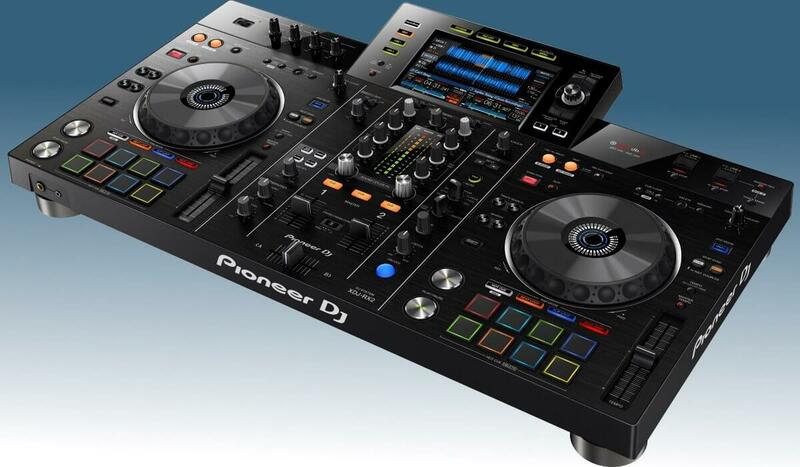 The XDJ-RX2 biggest difference is that it’s a 2 channel unit. The two channels do have individual RCA inputs, and there are also 2 mic inputs, but if the Prime 4 offers more control over each mic channel. Each unit has two types of effects onboard: the XDJ-RX2 has 4 sound color effects onboard, and 8 beat effects. The effects are incorporated into the mixer in the same way they are incorporated into a professional DJM mixer: sound color effects on the left, and the beat effects section on the right. The Prime 4 does things a bit differently: there are 4 sweep effects very similar to Pioneer DJ’s color effects integrated into the mixer. But the beat effects are integrated into the decks in a way that’s very recognizable to users of DJ controllers. In my opinion, this is the perfect way to implement beat effects. The different effect parameters are easy to use and access. The small screens on top of each knob give you all the info you need, making it easy to be in control of your effects at any time. The Prime 4 also features Zone output, which allows you to send a specific channel to a specific output, separated from the master and the booth output. This is very handy for event DJ’s that want to have a separate playlist playing in a separate room while playing a main set in the main room. DENON DJ PRIME 4 The Prime 4 wins this part. The mixer is basically a complete 4 channel club mixer in a compact all-in-one format. Add to the that the extensive effects options, the zone output and the professional array of inputs and outputs, and the XDJ-RX2 is clearly outmatched here. Denon DJ Prime 4 versus Pioneer DJ XDJ-RX2: the storage options compared. The XDJ-RX2 has two USB inputs, one of them can be used to record your set straight to USB media. The Prime 4 takes things a little bit further. It also has two USB inputs but to that it ads an SD card slot, and, most impressive of all, a slot for an SSD drive. The slot is hidden on the bottom of the unit, but Denon DJ has made it easy to update the drive’s content by connecting the Prime 4 to your computer and Engine Prime via USB. DENON DJ PRIME 4 I have to give the win again to the Prime 4. With the addition of the SD card slot and the SDD slot, the Prime 4 has more storage options and is, therefore, more versatile than the XDJ-RX2. 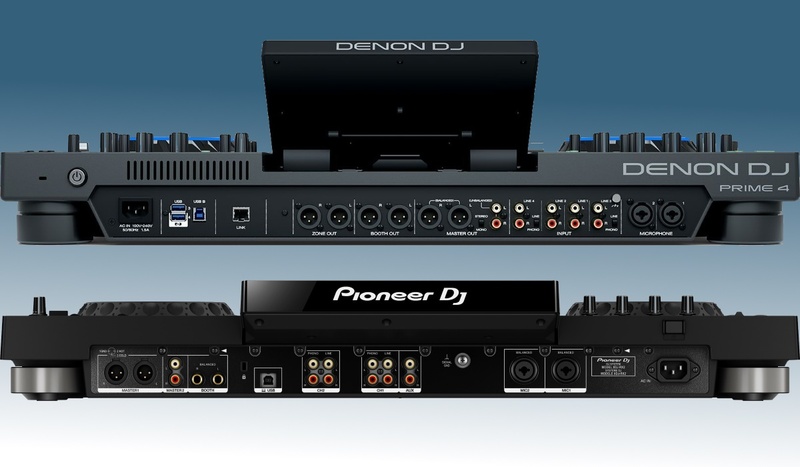 Denon DJ Prime 4 versus Pioneer DJ XDJ-RX2: the inputs and outputs compared. The Prime 4 has a massive amount of outputs and inputs. In addition to all the storage options available, there are two additional USB ports on the back to connect more USB mass media. There is an Ethernet link port, and a total of 3 XLR outputs: one for the booth output, one for the master output and one for the zone output. There is also an unbalanced RCA master output. Furthermore, each channel has its dedicated RCA input, with channels 3 and 4 switchable between line and phono. Finally, the Prime 4 features two XLR microphone inputs. The XDJ-RX2 is also very well equipped, with XLR master out, RCA master out and TRS booth out. Each channel has two RCA inputs, one for phono and one for line. There is also a very handy AUX RCA input. Finally, there are two XLR mic inputs. DENON DJ PRIME 4 And yes, the Prime 4 takes the win here as well. The 4 hardware channels open up so many possibilities, and the zone output is unique to the Prime 4 and will certainly be heavily used. Engine Prime, the music preparation software that comes with the Prime 4, has come a long way and is today a stable and versatile platform. 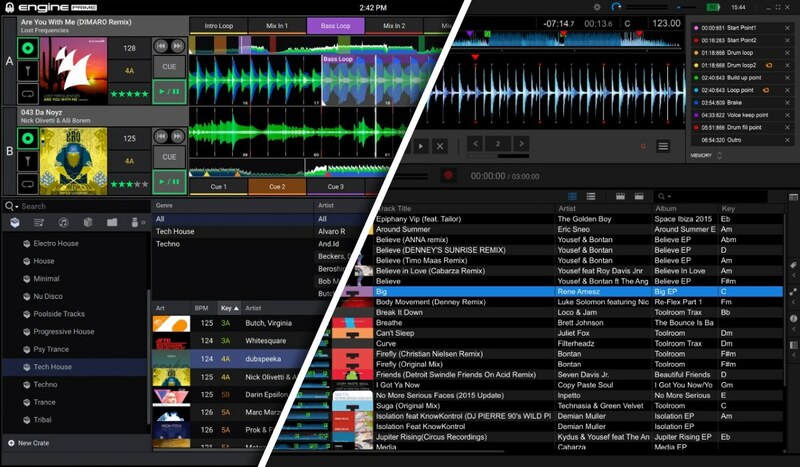 It’s also very open, being able to manage Serato and Traktor Pro playlists and track data. But Rekordbox has been around for much longer and has had the chance to mature more. Thus, it’s more sophisticated and feels more robust than Engine Prime. Also, the XDJ-RX2 can be used as a DJ controller with Rekordbox DJ, the performance part of Rekordbox, and that’s something Engine Prime can’t do on the Prime 4. 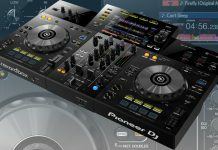 Pioneer DJ XDJ-RX2 Finally a win for the XDJ-RX2! It might not be the most prestigious thing to win over software, but it’s a critical part of an all-in-one DJ system. Without stable and robust software, the entire system simply falls apart. To be frank, it’s not a fair fight. 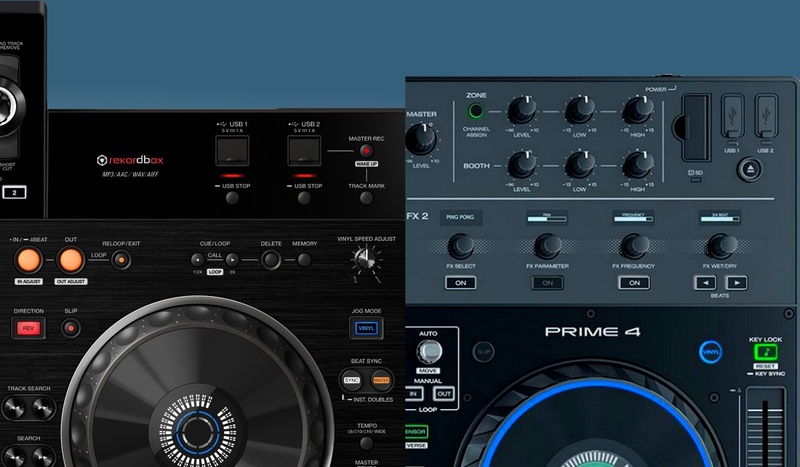 The Prime 4 has simply more ammunition than the XDJ-RX2. It has more channels, more outputs, a bigger screen, and more storage options, and on top of that, it costs basically the same. Does this mean that the XDJ-RX2’s sales will plummet when the Prime 4 comes out? Not by a long shot. Because in the same way that Apple remains a key player in the smartphone business despite Samsung and Huawei having technologically more advanced offers, the XDJ-RX2 will survive the Prime 4 because of the Pioneer DJ brand name and associated premium feel. Pioneer DJ is still the industry leader, and the XDJ-RX2 gives you the feel of a professional CDJ+DJM setup for the less than half the price. 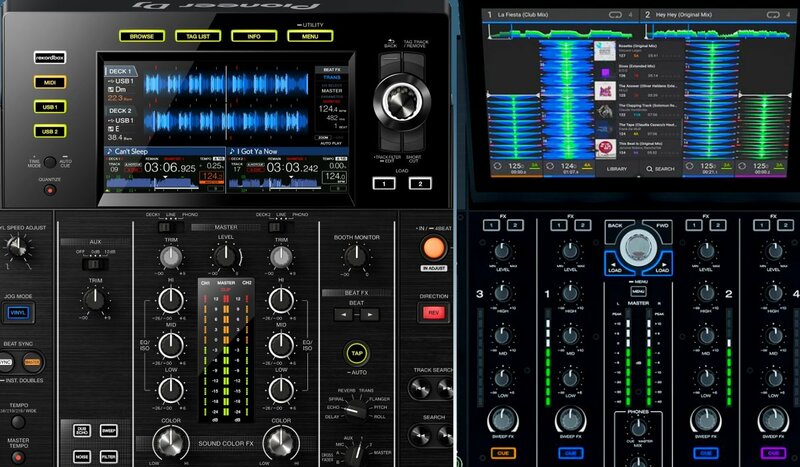 Add to that that the combination of hardware (XDJ-RX2) and software (Rekordbox) is still the most popular ecosystem in the DJ industry, certainly on the professional level. 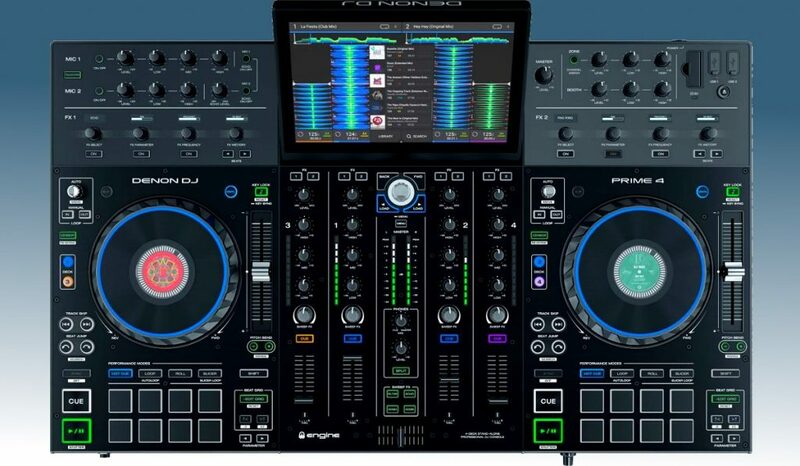 This will be enough motivation for many pro DJ’s that need an affordable all-in-one DJ system to go with the XDJ-RX2 instead of the Prime 4, even if the Prime is objectively the better choice when it comes to features. Denon DJ knows this, and that’s why you see this kind of offer for this kind of price, as they need to compensate for the “premium” and “industry standard” brand image that Pioneer DJ carries. So expect a tight race, and Pioneer DJ will certainly evolve their professional gear to match the technology in Denon DJ’s Prime systems. Exciting times ahead! 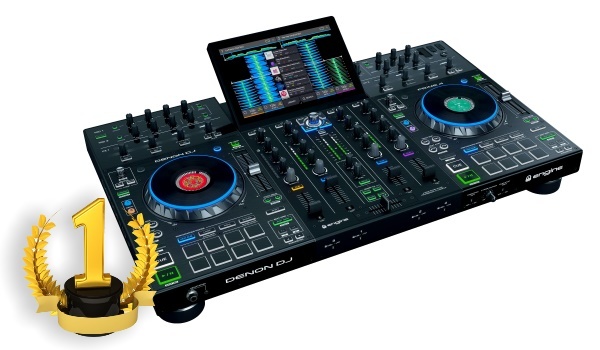 The Denon DJ Prime 4 is the overall winner of the comparison. Based on the overall package, it’s simply the unit that gives you the most bang for your buck. This doesn’t disqualify the XDJ-RX2 in any way, as it certainly remains the best choice for those who want to get very close to a professional Pioneer DJ setup and still pay a reasonable price. After all, the Pioneer DJ ecosystem is what it is, and once you are part of it, it’s hard to get away from it. But if you don’t care about all that and want the most bells and whistles, the Prime 4 delivers big.